We’ve just resurfaced from a short but noticeable internet downtime due to moving (yes, once again! We’re becoming pros). As we walked around our new home among unpacked boxes and well, the usual mayhem that follows a move, one of the first few things that we took out of its box and placed carefully was our beloved Himalayan Salt Lamp. Not the most useful thing in a new, empty house you might think? Well, you could be wrong, and this is the perfect opportunity to tell you why, and how a Salt Light can improve your life & home, too. 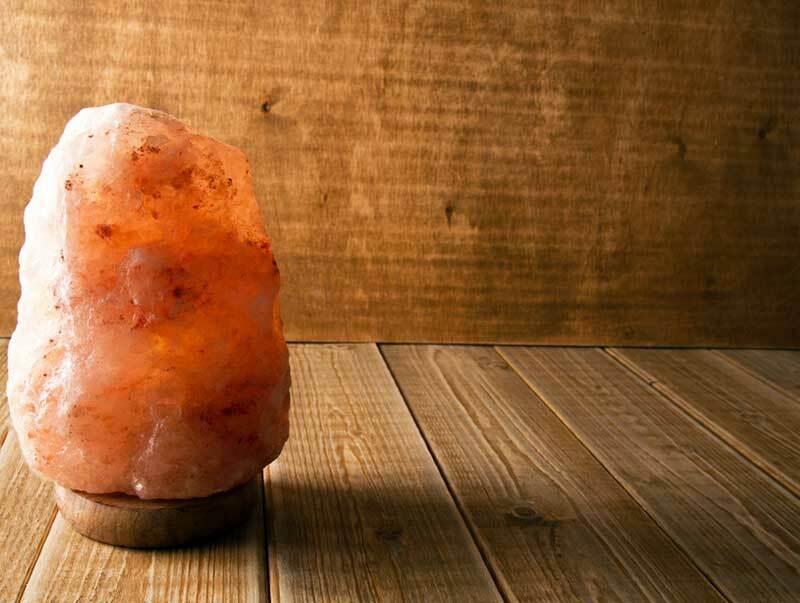 Salt lamps are not simply decorative objects that emit an elegant and soft light: they are made of a mineral-rich natural salt that has naturally formed over millions of years due to the progressive rise of the Himalayan mountain range and the retreat of sea waters. These lamps are formed by salt crystals emitting negative ions into the air of a room, which helps to purify it. Negative ions are to be found in nature, in places like the beach, the mountains and in forests. This is the reason why these lamps have an ionizing effect that gives a pleasant feeling of well-being. Salt lamps can make the air we breathe in the rooms of our home healthier by protecting us from the electromagnetic fields generated by computers and other electrical devices – for this reason it is especially advisable to have one in the office and on your desk at home. They can also be strategically placed near a television, in smokers’ rooms, or rooms devoted to relaxation, sleep, perhaps yoga – in order for the lamp to illuminate with its characteristic warm/amber light, create an intimate and pleasant atmosphere and make the room healthier at the same time. Furthermore, the use of a salt lamp promotes concentration and attention, improves productivity and stimulates the immune system: the shade of the light emitted by the salt lamps has beneficial effects as the orange color is relaxing, according to color therapy, stimulating creativity and the joy of living. The salt lamps make the energy of the environment more stable, harmonious and lighter. For best results it is advisable to leave the salt lamp on at least 6 continuous hours every day. After a few hours you will notice that water collects at the base. This is quite normal as the salt dehumidifies the air: all you have to pay attention to, is to place the lamp over a little dish ir order nor to ruin your furniture/floor. 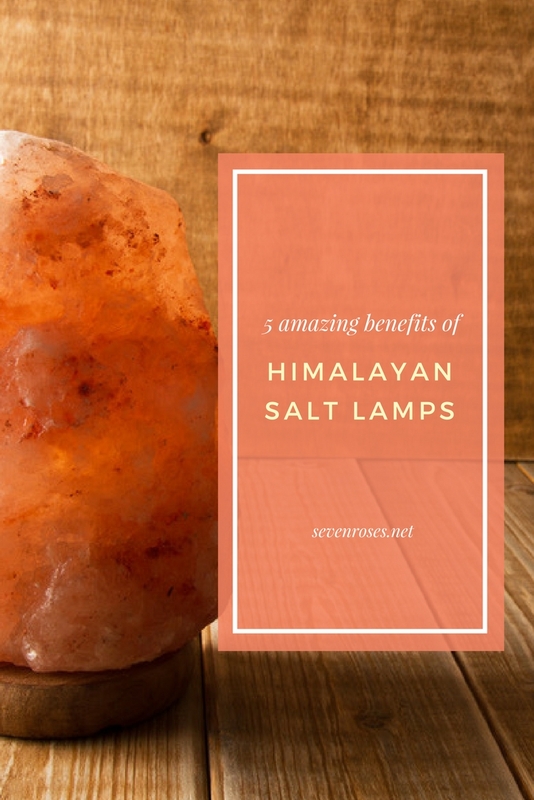 The Himalayan Salt Lamps we have at home comes from SoWell (affiliate link) because their lamps are ethically sourced, fair trade handmade by artisans in Pakistan (the only source of true pink Himalayan salt). Also, they have a generous 23% site-wide discount until 06/30 for SevenRoses.net readers. Just click here to enjoy your discount. Did you enjoy this post? I would love for you to pin it or share it on your social media to spread the good vibes! Thank you! I love this! I love how you explained the ions thing because that gets confusing to me (: my original salt lamp of like 7 years just broke (the fusing somehow stopped working? ), so I had to buy another right away. I even love the relaxing glow they cast in the room.. instant relaxation (: love this post! Hello Allie, thank you so much for stopping by! The negative ions are such powerful little things :) I love the glow of salt lamps too, I first got interested in them years ago just for the soothing light… and then learned all about them and fell in love. I did not realize that a salt lamp had so many health benefits. I’ve seen them on tv but didn’t really know much about them. I’m going to check into getting one for myself. 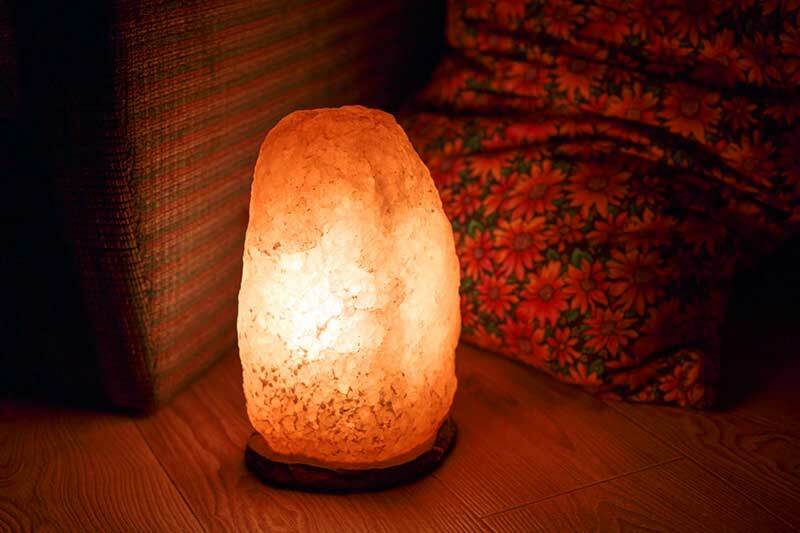 I have not heard of a salt lamp before and am so amazed by all the wonderful health benefits! Definitely need to check this one out! they use these at a spa i go to & always wondered what they were all about! great post – i want to get one – i can use all the positive energy around me i can get! Hello Hal and thank you for your comment :-) the fact that such lamps are used in SPAs is a good hint at how relaxing they are indeed! I should have read this before ruining my windowsill! I was really surprised that it eroded! Very helpful, thanks. oooo I almost had my sister buy me one of these but then changed my mind right before we were about to check out! But after reading this I may have to go back and get it! Thanks for this post, I really didn’t fully understand the reasoning/benefits, thinking about buying one now. I’ve heard really good things about using salt lamps for anxiety. I would totally be up for trying it, but the ones I’ve seem are so expensive! Know any place to get them cheaper? My ex-boss had a salt lamp. He swore by them. I think I could use one to help my concentration! That is so interesting. I had wondered about the benefits. I have always thought they were beautiful. I should get one! I thought these lamps were simply decorative! I had no idea they had so many positive benefits to them! Great post – I had often wondered what the deal is with these beautiful lamps. I need to pick up one or two. Thanks so much for the helpful info! I never knew all of these benefits! I totally agree with you though, if spa’s have them then that obviously speaks to their calming powers! Previously I had heard that there were benefits to these lamps but now that I know on a more extensive basis I really feel like I need one!!! I LOVE my Himalayan Salt Lamp. Thank you for posting about all the benefits! I use pink himalayan salt for cooking. Now I *have to* get one of this for the room – thanks for a great post! I’ve never heard about the Hiamlayan salt lamps before! I wouldn’t have known what a Himalayan salt lamp was unless I had seen on only last weekend in a health spa. I was sitting in the waiting room, relaxing on a wicker lounger, feeling totally at ease, and spotted it. And here you are talking about them now. I would certainly consider having one at home if I had the space (not so at the moment, due to my 5 year old).